Before we start, don’t worry, I’m not here to tell you off about your weak passwords. Although if your password is one of these, go change it now. No, right now. Come back to me when you’re done. What I want to discuss, is the user experience of creating passwords, and in particular, the user experience of resetting a password. Let me tell you an anecdote. Last weekend, I sat beside my partner as she got more and more frustrated while trying to log in to a website. My partner is the same age as me, and although she doesn’t design and build websites, she does work with some pretty complex technology, so she’s not a Luddite. She was trying to submit some meter readings (very grown-up, I know), so giving up and going elsewhere wasn’t an option. With an online shopping experience, any friction in the user experience will result in you losing customers. This unfortunately wasn’t an option. Unable to log in, she did what we all do and went through her usual passwords, then her variations on these passwords. No joy. So a password reset was required. Upon which she was greeted with this long list of criteria that the password needed to meet. Suddenly it was very clear why she couldn’t remember, or even guess at her password. 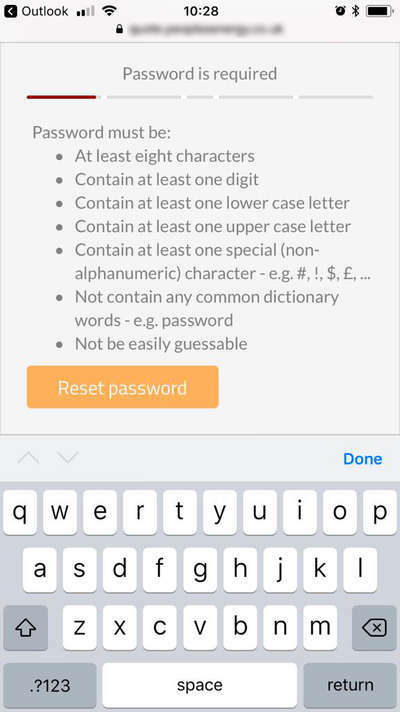 After typing in her new password (on a mobile), she must have made a small typo from what she thought she had entered, and because there was no “Confirm Password” input field, she didn’t know this until she tried to log in again. Which meant resetting the password… again. After 5 or so very frustrating minutes, she eventually got logged in. I have a feeling that lots of other people would have given up and called the company instead - poor use of time for both the customer and the company in question. I would like to say that this anecdote is unusual but I know from my own experience that it is not. I’ve even experienced websites with far stricter rules; rules likes not repeating patterns of characters or even using the same character twice. This was probably the biggest gripe of the whole experience. Having a reminder of the password rules at the point of login, while not normal, is probably a good idea if you are going to make your login rules so strict. I appreciate why you would not want to have the rules up-front for security reasons, as a means of preventing brute force attacks (trial and error of guessing a login). However, this logic quickly falls away when you realise that you already present the login rules to the public (non-logged in users) anyway when they create an account. Even if you don’t want to show the rules on the initial login screen, if the user fails to login, why not include the rules as a reminder in the error messages? This would help people remember what they might have used, if their normal password doesn’t meet your criteria. I would like to think that most people nowadays aim to have at least relatively secure passwords - trying to strike the balance between passwords that are hard to crack and ones that they will remember. This one is pretty basic. 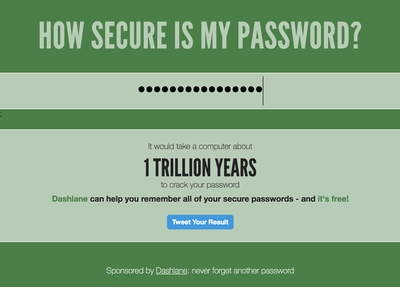 When setting a password, most websites will make you enter it twice, and for good reason. Password fields use an asterisk or dot to indicate the number of characters you have entered, with the basic security of obscuring your password from anyone who may be watching over your shoulder. When setting your password, you can’t visually check that you have correctly entered your new password, so being asked to confirm what you have entered is a great sanity check. If the two fields match, there is a pretty good chance that the password entered is what you intended. You have probably already seen this relatively new web pattern. It is quite common on mobile apps, and is becoming more popular on websites too, especially those with high mobile traffic. 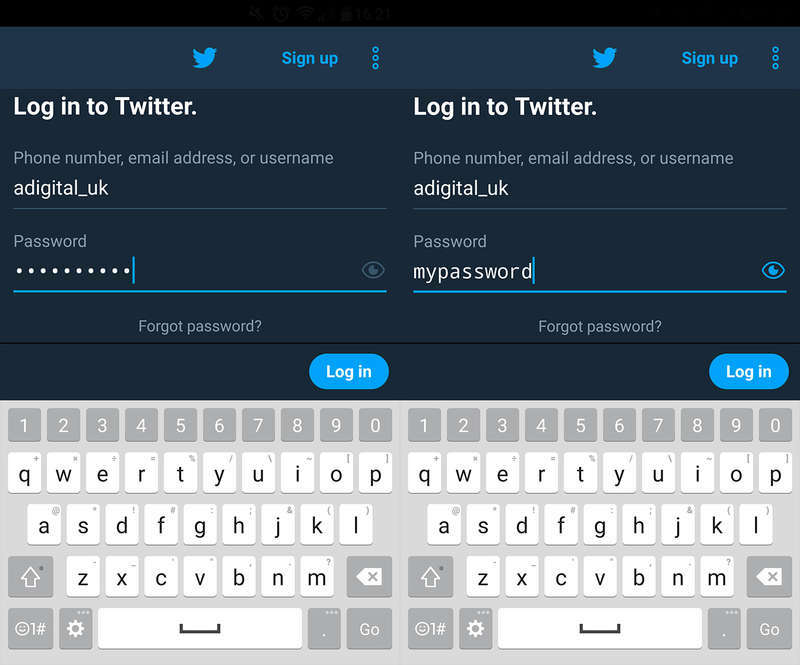 Very simply, the password field has an option, usually an icon, that allows users to toggle back and forth between password (asterisk or dots) and plain text view. By giving the user this option, it means they can visually check the password before submitting it. This functionality comes in handy for both password reset and login forms. It removes one of those layers of friction that we spoke about earlier. The experience my partner had with logging in to submit meter readings is made all the more frustrating, knowing that a few simple steps would have greatly improved the user experience. But what her experience with the login and password reset forms suggests, is that the website owners are more concerned with security, even to the detriment of their users. I’m all for security, but when a few simple steps would make life easier for your users, without sacrificing security, why wouldn’t you take these steps? The developers of this website are essentially encouraging people to use randomly generated passwords, which in itself is not a problem. But members of the general public don’t, or should I say won’t, keep a record of complex/unrememberable passwords. And why should they? While I can’t say that we at A Digital haven’t also made these mistakes, what I can say is that by watching someone else come up against hurdles using a website, I have learnt a lot of valuable lessons to bring forward into our new projects - lessons that I felt were important enough to share here with you. I hope you find these insights useful in your upcoming website projects.